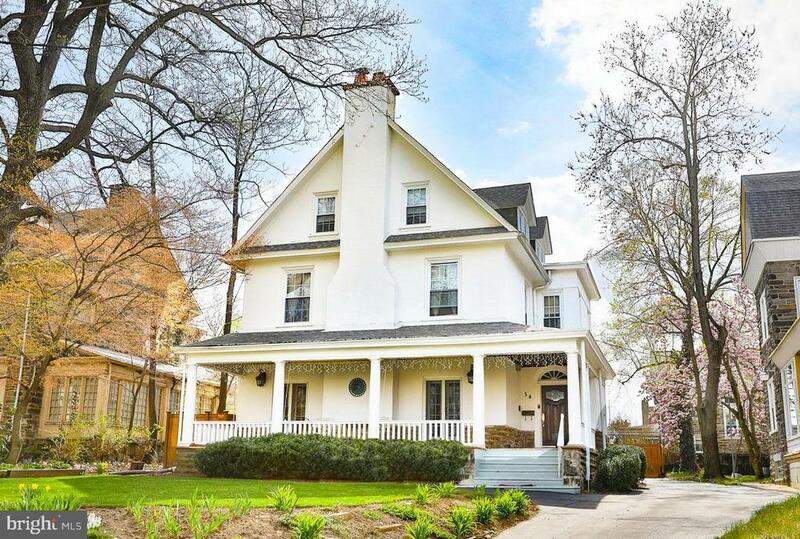 Imagine Living In An American Classic stone & stucco c 1895 with 6 Spacious Bedrooms, 3 Full Baths, 1st floor powder room, CENTRAL AIR, fully finished ceramic tiled dry basement in beautiful move-in condition. This Home Was Built For Its Own Tradition With 1 Working Walled Brick Detailed Fireplace in the Living Room, Formal Dining Room, Pellet Stove in the 2nd floor family room with a room full of windows overlooking Historic Upsala, 2nd floor office and 2nd floor laundry, Moldings, Deco Light Fixtures, all new replacement Windows, Palladium Window, French Doors, And Summer Sleeping Porch. Original Architectural Amenities Abound With 3 updated Newer Baths, One year NEW Ultra Gourmet Kitchen full of the most influential sentiments of pure splendor.Custom Shaker installed Ash wood cabinets, reclaimed wood Island, corian counter-tops, Mexican tiled back splash, Thermador gas 6-burner chef range and stainless Kitchen-aid dishwasher, double door stainless fridge, microwave, double deep farmers sink, garb disp, wine cooler, walk-in pantry with etched glass door, skylights. American architect Frank Lloyd Wright once mentioned that the best friend of the earth and of man is the tree. This is why the owners embraced the solid attributes of Lancaster County Ash wood to embrace the solid wood with Kitchen cabinets in high regard.A few mentions: Magnificent Brazilian cherry floors on the first floor, Newly laid Oak Floors On 2nd floors and stairs, Carpets On 3rd Floor. Off-Street Parking For Two Cars and two car detached garage, Front, Side And Rear Yards, separate entrance to enclosed organic garden, Yard With tons of flowering bushes, Mature Plantings, tool shed, double patios, & pergola. Also: state of the art mechanics, completely re-wired, recently painted inside and out, wrap around sitting front porch, in Premier Location!This breathtakingly beautiful home is the perfect personification for clean and natural aspects exhibiting all form as function as one with over 6000+ interior sq ft of light, air, open space, is a home that radiates a rare quality in superb condition available to you in West Mt Airy.